Our latest release is here! This update contains a variety of bug fixes, improvements, and new features, including the new highly anticipated OfficeTools eSignatures. With this update there have been some major speed improvements throughout the program that allows WorkSpace to run more efficiently and smoothly. There has also been a vast improvement on the memory management of the system as a whole, bringing down the amount of memory WorkSpace uses over longer periods of time. This update contains database changes that will require all users to be updated to this version of WorkSpace or certain features will not work properly. Once the database has been updated, all users must be on version 2016.170 or greater in order to access WorkSpace. DemandForce Users: This update version will not be compatible with DemandForce. In order to continue using the DemandForce sync, you will be required to be on versions 2016.028, 2016.030, 2016.050 or 2016.065. Future Updates (2017) will be compatible with the DemandForce Sync. Portal Users: In order to use the updated portal features, you will need to update the server components with the installer provided below. These components will require .NET Framework 4.5.2 to be installed on the server and is included in the server installer at the bottom of the page. eSignatures: If you plan on using our new eSignatures functionality, you are also required to install an updated version of the server components. Currently, you must be a subscriber to the portal in order to use eSignatures. QuickBooks Users: If you having problems with the Quickbooks Sync connecting, you may do the following in order to resolve it. 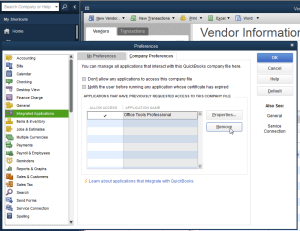 You can manually remove the application access from Quickbooks by logging into Quickbooks as an Admin under single-user mode and going to Edit -> Preferences -> Intergrations and Applications. From there you will navigate to the My Company tab and remove the Office Tools Professional certificate. 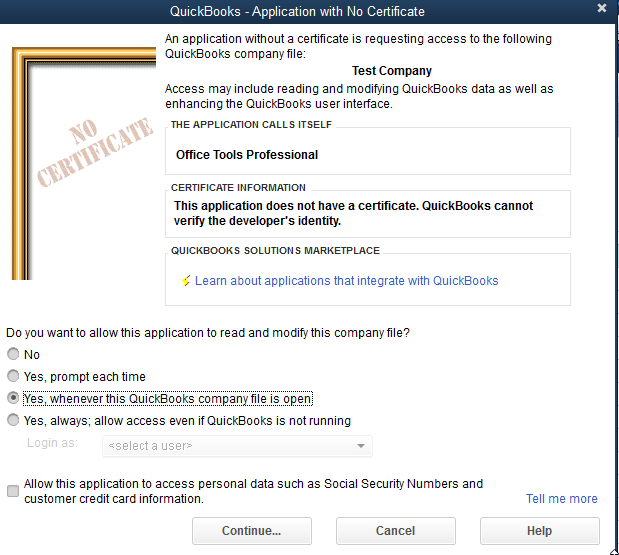 Upon doing so, when Office Tools WorkSpace re-connects to Quickbooks, you will be prompted to accept the Office Tools Professional certificate. [OTP-702] – Fixed issue where Project alias does not show on the activity list correctly if changed. [OTP-1637] – Fixed issue with assignments not sorting by project received date. [OTP-2032] – Fixed issue with Billing Statements not using letterhead settings. [OTP-2129] – Fixed issue where the save path cannot be set via ellipsis when trying to export contacts via excel exporter. [OTP-2133] – The work code list now saves custom sort. [OTP-2137] – Fixed issue where Referred By value was disappearing when the referred contact gets hidden. [OTP-2138] – The time card expense will now show a prompt when closing if there is an amount, markup, or note field items entered but no expense code is entered. [OTP-2141] – Contact list now refreshes right away after merging and deleting a contact. [OTP-2146] – Fixed issue where the Referred By list was not listing all contacts. [OTP-2147] – Fixed issue with changing the FYE date in the global settings while using multi office. [OTP-2149] – Fixed issue with “sign in ledger” schedule report not showing appointments in chronological order. [OTP-2150] – Fixed issue with staff activity report displaying a blank report when filtering by event type. [OTP-2152] – Staff budget now displays correctly when changing views. [OTP-2153] – Fixed issue where custom field percentage report is displaying a blank report when adding filters. [OTP-2159] – Fixed issue with staff utilization report showing negative numbers under payments. [OTP-2168] – Fixed day/time stamp bug with documents that are uploaded to the portal. [OTP-2176] – Fixed issue with Aimi crashing when you create a timer and associate it to a project. [OTP-2182] – Fixed issue where an error message will come up when trying to selecting an image from twitter on the contacts tab. [OTP-2183] – Fixed issue with partial project due date reports cutting off the dates of project notes. [OTP-2192] – Fixed issue with mail settings for emails that are not using Outlook for email. [OTP-2195] – Changed the order of how an assignment work code populates in pop up time card. [OTP-2197] – Fixed an issue with printing project notes. [OTP-2198] – Changed how Default work codes are prioritized when a user has predefined work codes for events. [OTP-2203] – Fixed bug with default work codes and project definitions. [OTP-2218] – Missing info items has a 255 characters restriction. [OTP-2232] – Portal documents can have special characters. [OTP-2233] – Invoice numbers were not displaying in the AR reconciliation full detail report. [OTP-2274] – Fixed an issue with PDF print driver and associating a document to a project. [OTP-2276] – Enter no longer clears your search on the documents tab. [OTP-2283] – Added Group by billing manager to the Billing and Wip reconciliation report. [OTP-2301] – Fixed an issue with payments not on the portal. [OTP-2333] – Values in custom fields on contact tab can be removed now. [OTP-2385] – Fixed an issue with expense items pushing to QuickBooks. [OTP-2475] – Time restriction override. [OTP-2559] – Fixed an issue with schedule availability on the portal. [OTP-2584] – Fixed an issue with saving options on custom reports. [OTP-2618] – Added address options to Progress bill. [OTP-2643] – Can set sort the order for project definitions. [OTP-2679] – Fixed an issue when adding more than on to–dos. [OTP-2741] – Fixed an issue with when a contact updates their information on the portal. [OTP-3128] – add contact in more contacts menu edits the main contact. [OTP-3130] – Invoice Reconciliation report does not work on invoice view. [OTP-3131] – save button on time tab does not work in contact view when trying to change the bill option. [OTP-3135] – state id # does not export. [OTP-3146] – Fix an issue with subtitle in my company information and settings. [OTP-3154] – Fixed an issue with mobile time sheet combo. [OTP-3157] – Fixed an issue with portal reminder emails. [OTP-3172] – Fixed a display issue with year on a document uploaded to the portal. [OTP-3176] – Fixed an issue importing/exporting large Lacerte files into OfficeTools WorkSpace. [OTP-3200] – Fixed an issue with filters for project form letters. [OTP-3207] – Fixed issue with Delivery information on the project tab. [OTP-2944] – Billing user rights modification. [OTP-3159] – Added the ability to have multiple bank accounts for each company. [OTP-3188] – Added integration with FileCenter. [OTP-2130] – Split city, state, and zip options into their own text boxes under my company information and settings. [OTP-2131] – Remove multiple pop-ups user gets when uploading a document that is already on the portal for all repeating occurrences. [OTP-2144] – Add an option to setup one staff member to receive all notifications when client uploads a document to the portal. [OTP-2165] – Add the ability to select multiple staff to receive appointment request emails. [OTP-2207] – Update to way states and countries are added to the software, clean up states table. [OTP-2336] – Excel export contacts upgrade: make option to export specific clients and alt. contacts. [OTP-2346] – Update QB payment export to notify the user if a payment being exported already exists in QB. [OTP-2595] – Make the “x” on the portal schedule allow the user to cancel their own appointment(s). [OTP-2619] – Add option to print the progress bill title. 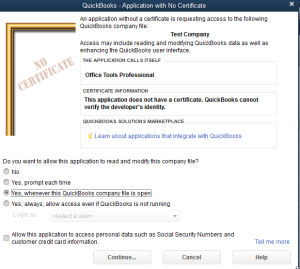 [OTP-2668] – Made data selection in QuickBooks integration for payment import form sticky. [OTP-2779] – Add option to turn the time and schedule tabs in the portal on/off. [OTP-2804] – Added office groups to the invoice reconciliation office groups. Multi Office feature only. [OTP-2812] – Added office group functionality. Multi Office feature only. [OTP-2866] – Import of QuickBooks invoices in to OTW for purposes of creating begging balances. [OTP-2874] – Add a prompt when a user tries to sync a contact with a Lacerte number that is no longer in Lacerte. [OTP-2875] – Add a tool tip to the account number field that shows the Lacerte client number if the current contact is synced to Lacerte. [OTP-2921] – Add an option to the billing comparison report to allow users to see hidden contacts. [OTP-2938] – Update tool that generates pdf invoices for printing and emailing. [OTP-2939] – Add option to print wip reports and billing statements when printing invoice. [OTP-3105] – Add option to repeat appointments yearly on specific numerical day(s). [OTP-3121] – Add a paperclip icon on an appointment when a document is attached to the appointment. [OTP-3136] – FileCenter addition – mark-up in FileCenter. [OTP-3144] – Added mass delete document function to portal. [OTP-3150] – Improved auto matching for the QuickBooks integration. [OTP-3156] – Calls with chosen event types can be set to permanent. [OTP-3161] – Performance, speed & optimizations. [OTP-3163] – Added more fields to the export of contact data from OfficeTools WorkSpace. [OTP-3166] – Email notifications when portal users get near or over file usage. [OTP-3170] – Increased speed of Portal downloads. [OTP-3204] – Added new options to letterhead. [OTP-2937] – Add ability to email invoices to multiple email addresses.